A species of Rotifaria, Brachionus quadridentatus. Photo by Frank Fox. 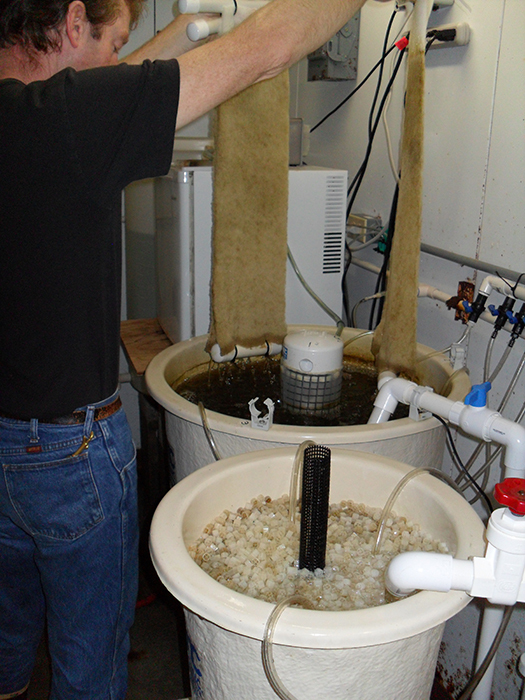 Commercial systems may be used to maintain continuous rotifer cultures. Photo by Kenneth Wingerter. In light of the aquaculture industry’s heavy dependence upon rotifers, the earliest references to rotifera by hatchery researchers are rather ironic. For decades, rotifers were generally regarded as pests by Japanese eel culturists. Summer phytoplankton crashes (or, “mizukawari”) were known to destabilize the delicate ecology of eel ponds. These events apparently triggered a rapid reduction in dissolved oxygen concentration (often to <1.0 ppm), leading to the asphyxiation and eventual death of valuable grow-out stock. Then, about half a century ago, Dr. Takashi Ito showed conclusively that rotifers were the cause of the phenomenon; and then, oddly enough, he set out to successfully use the common pest as a live food for the larvae of certain fish species. This effort culminated in major progress in the commercial production of the sea bream (Pagrus major). With the ongoing refinement of mass culture technique, rotifers have since proven integral in the commercial production of dozens—maybe hundreds—of species of finfish and crustacea, and counting. Furthermore, rotifers are increasingly being used as feed for many suspension-feeding corals, bivalve mollusks and tunicates. 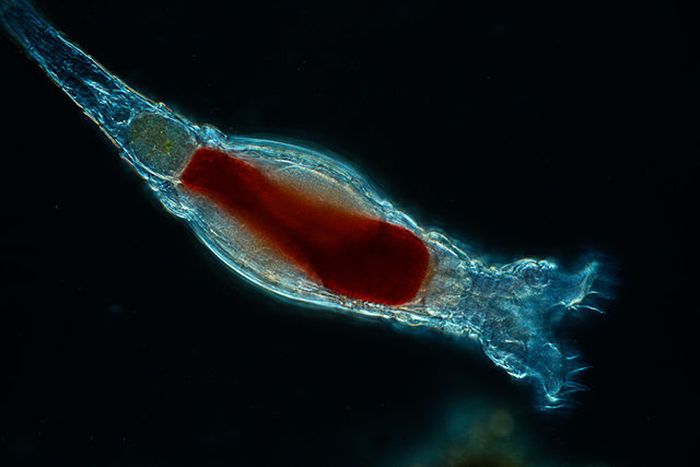 Once concentrated in the feeding vessel, live rotifers should be used as soon as possible. Photo by Kenneth Wingerter. Sources for live rotifers vary. They may, in the case of certain types of culture ponds, be present in abundance after spring phytoplankton blooms. Wild rotifers can be collected anywhere that they naturally occur; here, they are concentrated by attraction to a light source, captured in a small plankton net and sorted by pipette. Interestingly, some hatcheries have relied entirely upon wild rotifers; in one region in China near the Bohai Bay saltworks, wild rotifers are harvested for direct use as live food in local crab and shrimp hatcheries. However, for consistent availability and nutritional quality, the best source of rotifers is in-house production. Gut loaded with appropriate enrichment materials, rotifers make for a highly nutritious live feed. Photo by Kenneth Wingerter. Rotifer Culture Methods There are innumerable variations of rotifer culture technique; it is far beyond the scope of this article to describe all of them in any detail. Essentially, there are three basic methods of production, namely (1) batch culture, (2) semi-continuous culture and (3) continuous culture. The ideal culture method for a particular operation is usually determined by factors such as available floor space, available resources/labor and the number of rotifers needed over a given period of time. Batch culture is simple, requires little initial investment and can be carried out in little space; however, it requires much labor and produces cultures that are unstable and subject to rapid die-off (i.e., crashes). A small amount of formalin may be used to immobilize rotifers during counts. Continuous culture requires little labor (after initial set-up) and is less subject to instability and crashes; however, it is often highly intensive, requiring a substantial initial investment as well as a more highly trained operator. The term “semi-continuous” appears to be rather loosely defined, but generally refers to methods that are (as the term implies) moderately intensive, falling somewhere between the extremes of batch and continuous culture in terms of investment, labor and risk. Batch culture is generally a better investment of time, space and money for very small scales of production; however, the advantages of continuous culture increase with increasing daily production demands. 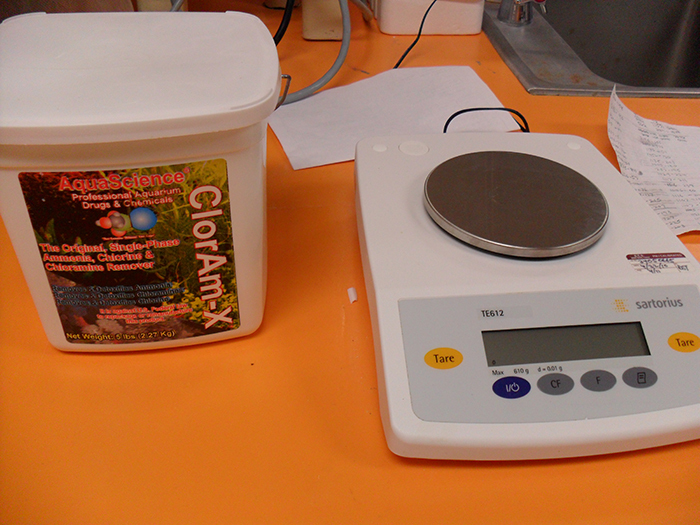 Using an appropriately sized collection screen will greatly facilitate rotifer harvest. Photo by Kenneth Wingerter. in a refrigerated environment. Photo by Kenneth Wingerter. Batch culture is especially ideal for hobby breeders, who usually need rather small numbers of rotifers on a sporadic basis. 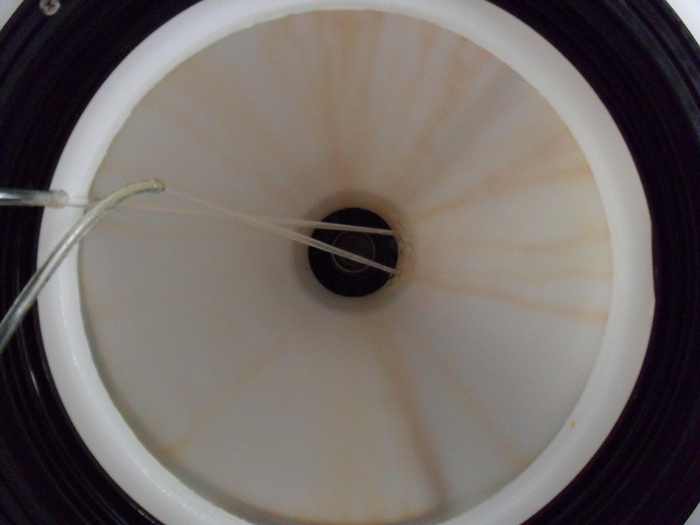 Batch cultures are typically, though not always, maintained in relatively small containers. 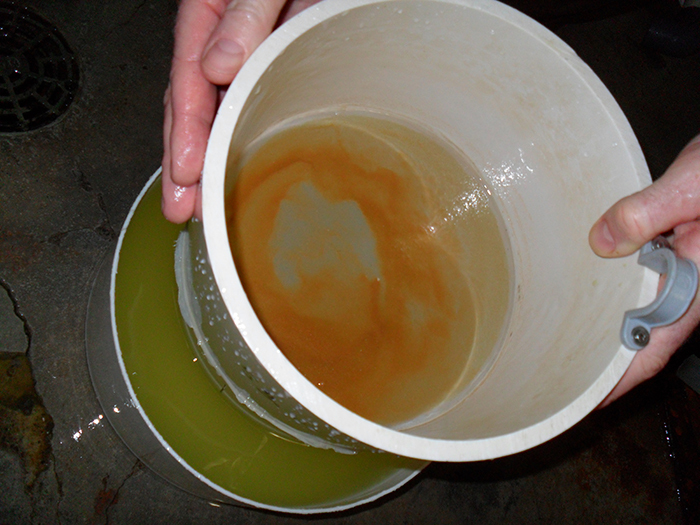 Batch culture can produce fairly dense populations of rotifers in a short amount of time. Either live or prepared algal feeds may be used. The entire culture is harvested just as the population approaches carrying capacity (approximately 200-600 rotifers/ml). Hence, batch cultures must be closely monitored (food levels, culture water parameters, population density, etc.) to determine the optimal time of harvest. Furthermore, the task of setting up and breaking down a culture vessel for each batch requires a considerable amount of work. Be that as it may, batch culture is not very intensive, requiring only a sterile container of some kind, some sterile water and an air pump/diffusor assembly. high-density cultures. Photo by Kenneth Wingerter. 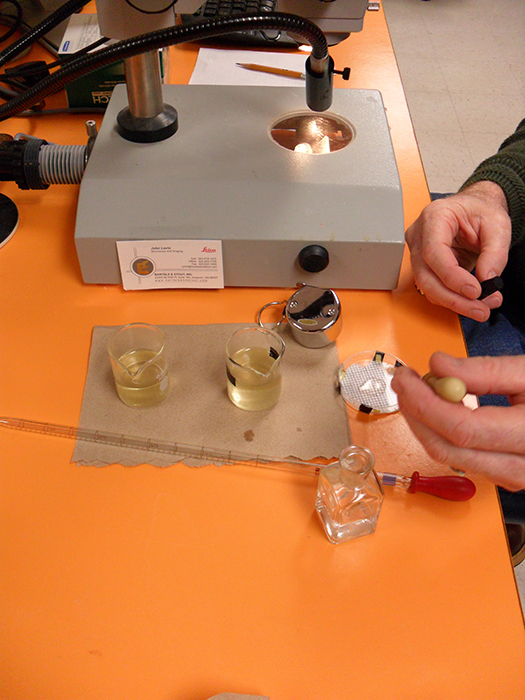 An example of a two-day batch culture method is provided by the Oceanic Institute. 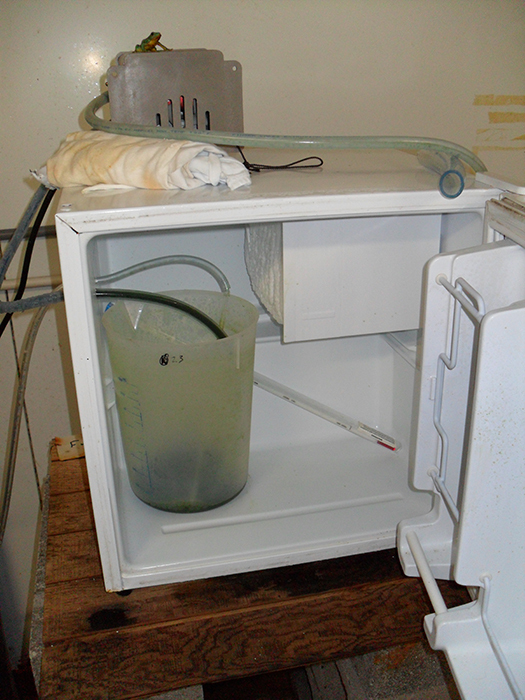 Tanks are half-filled with sterile culture water and inoculated with rotifers to a density of 100 individuals/ml. Phytoplankton is added at a density of 13-14 million cells/ml; active baker’s yeast is added two times/day at a quantity of 0.25 g/million rotifers. Tanks are filled with additional sterile culture water on the second day. Again, phytoplankton is added at a density of 13-14 million cells/ml; active baker’s yeast is added two times/day at a quantity of 0.375 g/million rotifers. The entire culture is harvested on the third day. herbivorous rotifers. Photo by Kenneth Wingerter. Semi-Continuous Culture Semi-continuous culture is usually ideal for a small, but steady, operation. Semi-continuous culture produces a moderately dense population of rotifers over longer periods of time with less labor; they can be maintained at low densities for 7–14 days without water renewal. The entire culture is harvested just as the population approaches carrying capacity (approximately 300-1000 rotifers/ml). Findings from research conducted by the author suggest that water parameter stability is more easily achieved by using prepared, rather than live, algal feeds. Photo by Kenneth Wingerter. 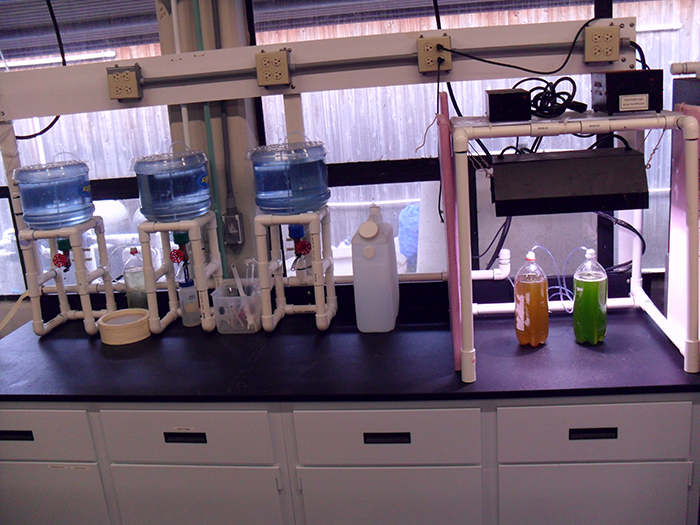 An example of a five-day semi-continuous culture method is also provided by the Oceanic Institute. On the first day, a culture vessel may be set up in the same manner described above, except that the container is filled to 25% total volume. On the second and third days, culture volume is doubled to bring the culture to full volume. 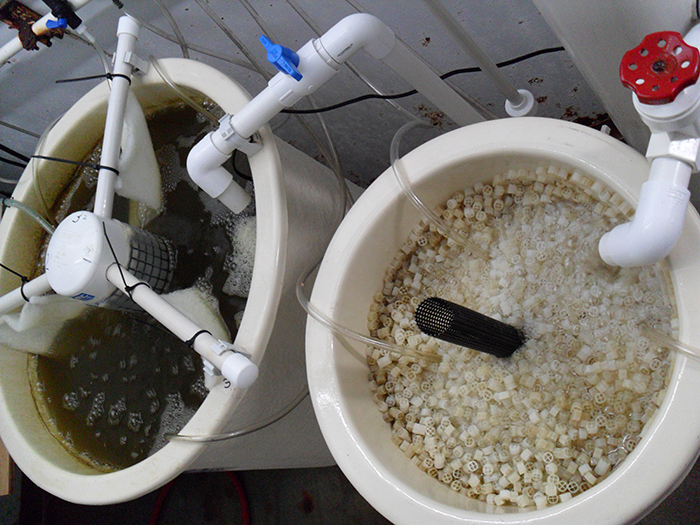 On the fourth and fifth days, half the tank volume is harvested and refilled again to reduce rotifer density by half. The entire culture is harvested on the sixth day. 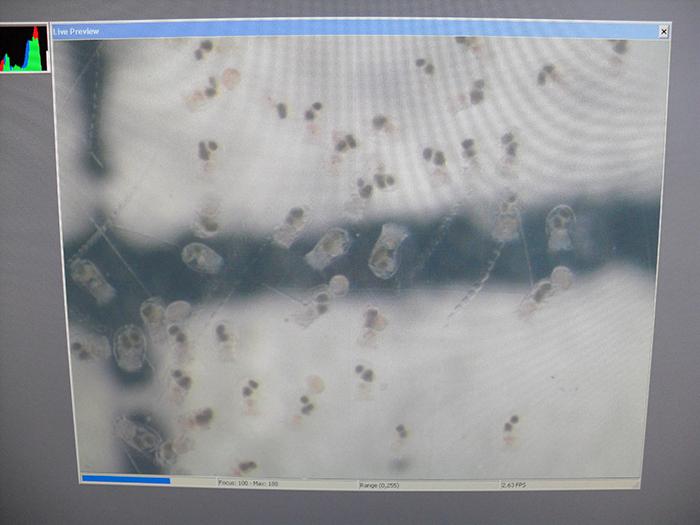 Computer monitors can help to enhance views of rotifers during counts or while under observation. Photo by Kenneth Wingerter. injection of pure oxygen into the culture water. Photo by Kenneth Wingerter. Continuous culture is usually ideal for hatcheries and other large, busy operations. 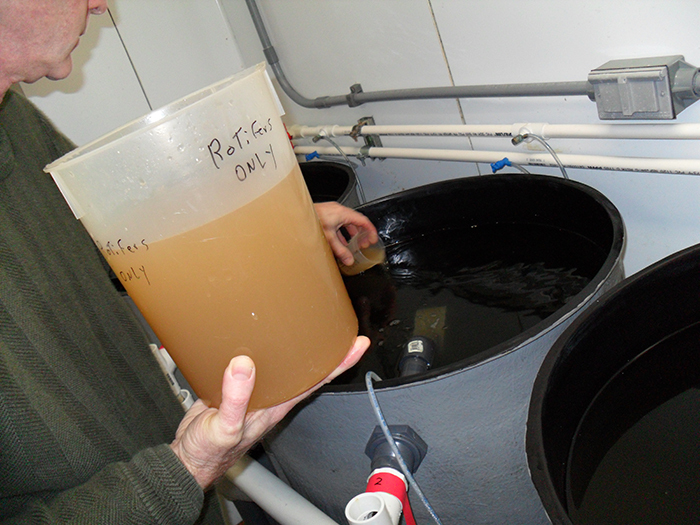 Continuous culture produces a very dense population of rotifers over extended periods of time with minimal work. High-density systems should be inoculated to densities >200 rotifers/ml. Densities of 4,000 rotifers/ml or higher can be maintained. 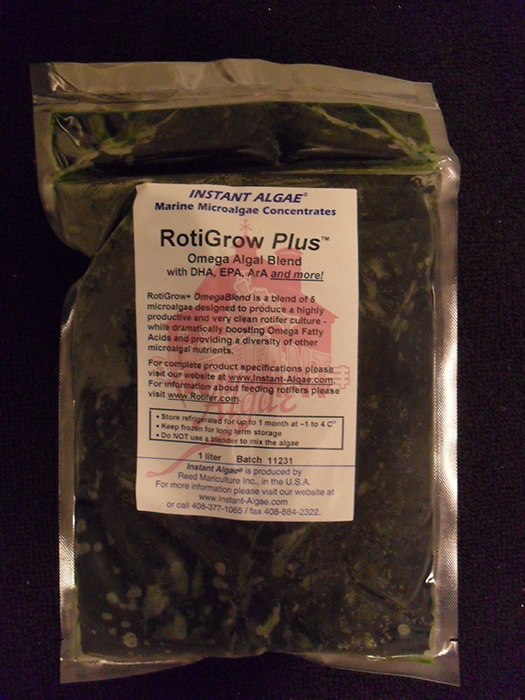 Only high-quality algal pastes are used here, as high feed rates make the cost of live algae prohibitive, while the continuous use of yeast can lead to the rapid deterioration of water quality. 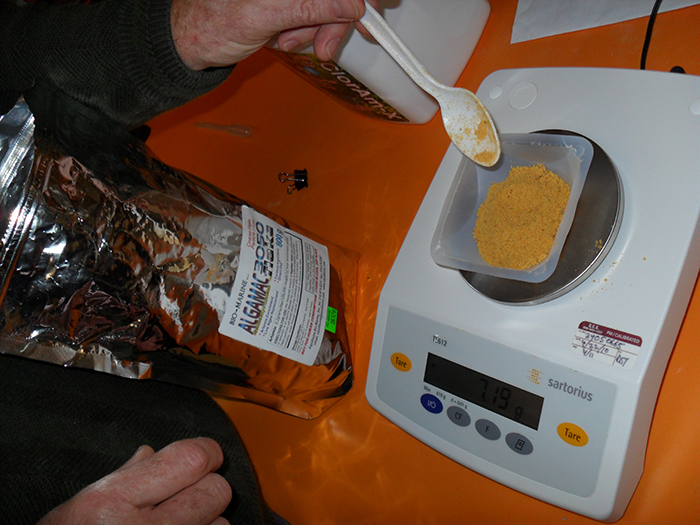 Depending upon the species of rotifer and feed content, as much as 1.5 ml paste/million rotifers/day can be added. A small portion (<25-50%) of the culture is harvested daily. Setting up a continuous culture system can involve much planning, construction and expense. 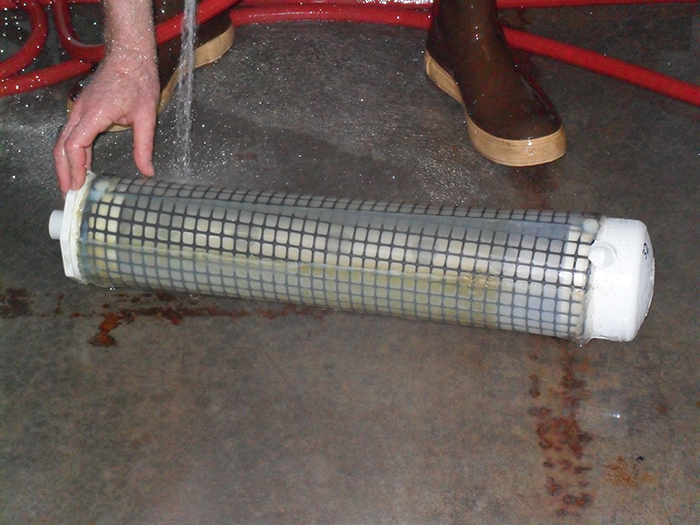 Screened standpipes must be used to keep rotifers out of filtration units on continuous culture systems. Photo by Kenneth Wingerter. Very high–density, continuous culture often requires aggressive biological filtration, protein skimming, supplemental oxygen, dosing of ammonia neutralizers, constant feeding through a peristaltic pump, etc. While operating, the system must be cleaned and monitored regularly to ensure that it is functioning properly. Still, once the culture system is fine-tuned and the culture is stable, continuous culture can consistently produce a huge number of rotifers per labor hour. high-density cultures, if rinsed regularly. Photo by Kenneth Wingerter. Low-density back-up cultures can be maintained almost indefinitely using little space, little (or no) filtration and very little food. Photo by Kenneth Wingerter. It is not preferable to rely solely upon portions of harvests for use as inoculant. Back-up cultures help to ensure the uninterrupted availability of rotifers in the event of mass crashes. They can be safely and indefinitely maintained with surprisingly little effort and floor space. A method of back-up culture preferred by the author is exceedingly simple. This method involves concurrently stocking two (the second serving as an additional precaution) back-up cultures. 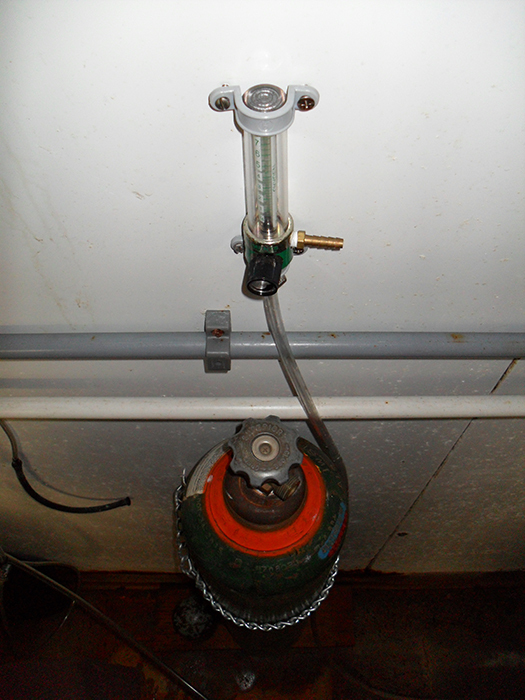 Two clean 10-gallon tanks are filled with clean culture water. Each tank is equipped with an air line and diffusor. 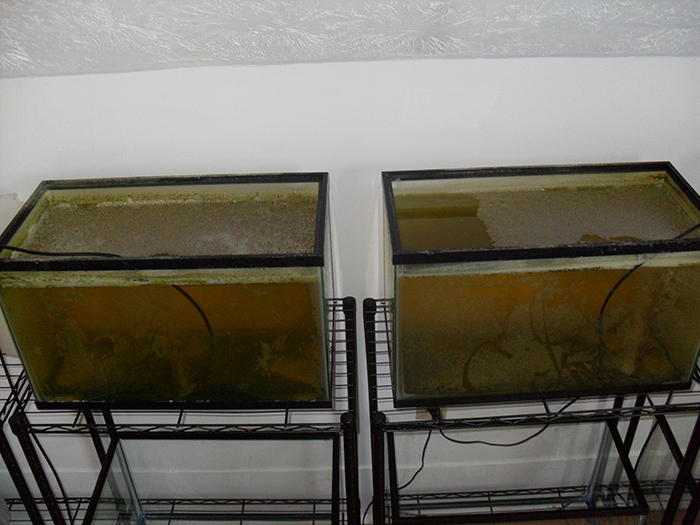 Each tank is inoculated with some number of rotifers (>10 rotifers/ml) and fed moderately with live or prepared algae (i.e., just enough that the water is slightly tinged green). Hereafter, the culture is fed only after the food has all but cleared. Very dense cultures can be thinned whenever they exceed 200 rotifers/ml. No regular water changes are performed. However, stirring the sediments every day or so (usually between feedings) appears to aid in nutrient cycling; large accumulations of sediment can be siphoned off the bottom (perhaps on a monthly basis). To help avoid settling of rotifers and enrichment materials, this enrichment vessel has a conical bottom and uses double airlines. Photo by Kenneth Wingerter. References 1. Campbell, Niel A. and Jane B. Reece. (2002). Biology (6th ed.). San Francisco, CA: Benjamin Cummings.